Seven Springs Ski Resort is one of Pennsylvania's top ski areas. If you are in the Mid-Atlantic region, this resort is a must to check out. Seven Springs Ski Resort is located in western Pennsylvania. This resort sits atop of the Laurel Highlands and has some of the best scenic views on the East Coast. This resort is great for families and has a wide range of activities to enjoy. There is something offered year-round at Seven Springs. From downhill skiing to tubing and from golfing to relaxing at the spa, this resort has a lot to offer. Seven Springs has a mountain elevation of 2,994 feet and has 285 acres of skiable terrain. 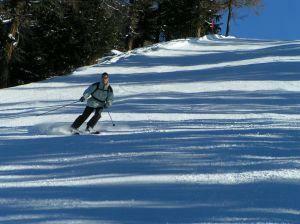 The longest ski run is 1.25 miles. Seven Springs gets around 105 inches of natural snow during the winter season and has state-of-the-art snowmaking capabilities as well. The resort's ski season is from December to April. The average temperature is around 24 degrees. Getting up the slopes is easy at Seven Springs due to its numerous lifts. There are ten chairlifts including two six-passenger, three quad lifts and five triple lifts. In addition, there are three surface lifts and two conveyors. Ski lessons are offered for all levels of skiers from beginner to advanced. The Snowsport School has programs for both children and adults. They offer private and group lessons taught by professional instructors. Seven Springs is well noted for its downhill skiing, but there are also other attractions at the resort as well. If you take a break from skiing, consider a snowmobile tour or a snowcat ride. After a long day outdoors, relax at the Trillium Spa. Snow tubing is a fun activity for the whole family to enjoy. The tubing park has 11 chutes that are accessed by handlebar tows. Dining at one of the restaurants - from casual to fine dining, there is something for every taste! Seven Springs also has various shops featuring specialty items from leather goods to sundries. There is even a ski and snowboard shop selling clothing, ski and boarding equipment and accessories. Seven Springs Resort has a range of lodging options. Whether you like to stay in the main lodge hotel or a condominium, there is something to suit your needs. There are also cabins and chalets for rent at the resort. For those who live on the East Coast, Seven Springs is a great resort for skiers to check out. From the many slopes and trails to the terrain parks, there is something for any level skier or snowboarder.